Onions as room palette inspiration - creamy white, black and aged wood. 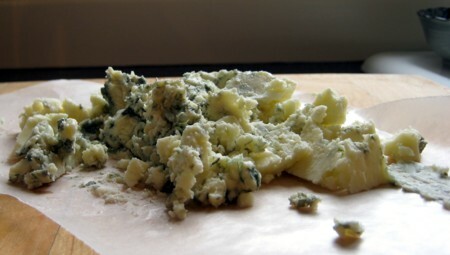 I love Gorgonzola cheese. Sprinkle it on my salad every day. Bought the coffee bowl in Paris. I could use a few more. . . I cheat and use frozen puff pastry. Serve these sweetie pies to guests for lunch - you'll get oohs and ahhs. 1. In saute pan over medium heat, warm olive oil. Add the onions and saute until golden brown, about 10 minutes. Add the water and continue to saute until all the moisture evaporates, about another 5 minutes. Add the Gorgonzola cheese and continue cooking, stirring occasionally, until melted, about 5 minutes longer. 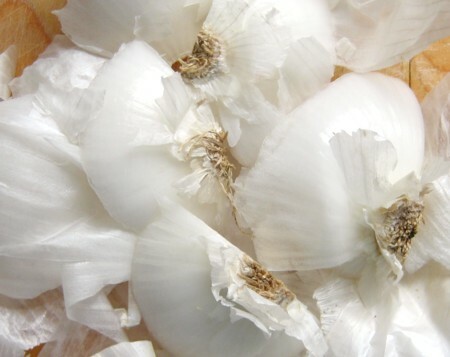 Season only lightly with salt, if needed, and add pepper to taste. Cool completely. 2. Preheat oven to 450 degrees. Grease a baking sheet with butter. 3. Place the puff pastry on a cutting board. 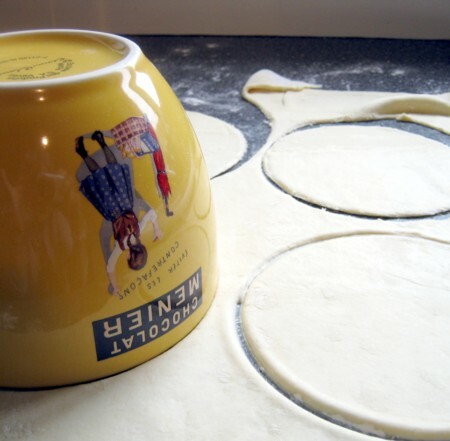 Using the rim of a small bowl about 5 inches in diameter, cut the pastry into 8 rounds. Gather the scraps and roll out, and cut 4 more rounds. 4. Place 6 rounds on the prepared baking sheet. Brush their outer rims and tops with the beaten egg. 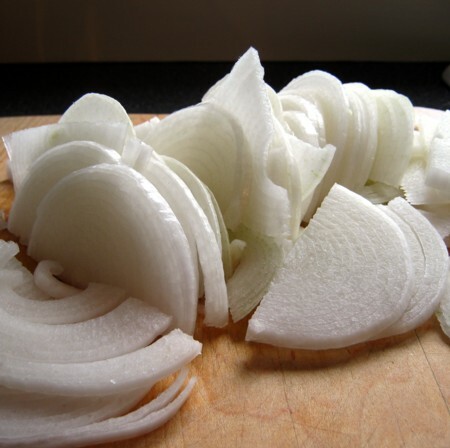 Evenly distribute the cooled onion mixture onto the middle of each round, leaving 1 inch uncovered around the edges. 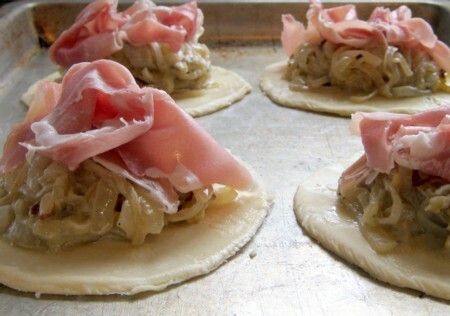 Place 1 prosciutto slice on top of each mound of onion mixture. 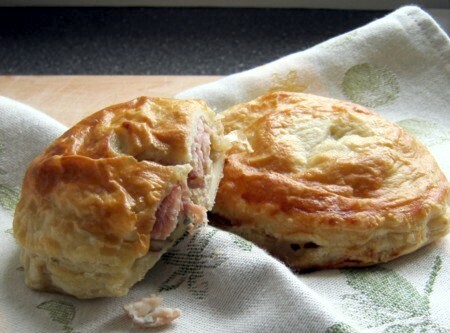 Cover each round with a second pastry round, making sure to pinch down firmly around the edges to seal in the filling. Brush the top of each "pie" with more of the beaten egg. Using a small, sharp knife, pierce the top of each pie once with a small slit. 5. Bake until golden brown, about 20 minutes. Remove from oven and serve immediately. Thank you Mark! The photographs are very experimental and if they come out well, it's as much luck as anything else. I hope you enjoy the pies. Thanks Jesica - they are perfect comfort food.